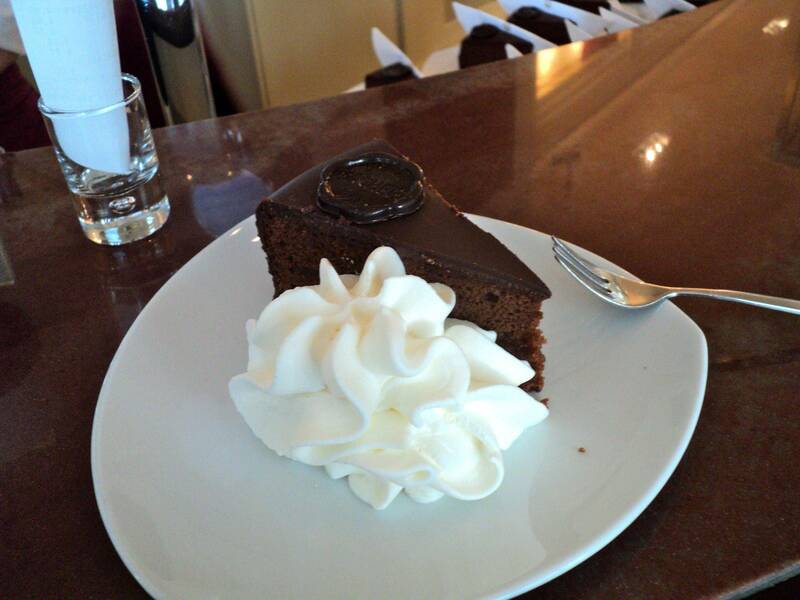 I was in Vienna over the weekend, and really, how could I avoid trying the Sachertorte? Traditionally served with unsweetened whipped cream, painted with apricot jam and completely covered with chocolate ganache, it was quite the experience. The recipe can be found here, among other places, but the secret to ‘real’ Sachertorte is in the frosting, which is rumored to be made from three kinds of chocolate made especially for the Hotel Sacher. Eating at the Hotel was a bit stressful–the line was out the door, and I had barely sat down at the bar when the waitress appeared, demanding to know what I wanted. Thankfully, my German stretches to asking for a coffee and cake. I also recently found myself in downtown Pest, District V, called Belváros (inner city), and, well, Gerbeaud is supposed to be the best of the best, cafe-wise. 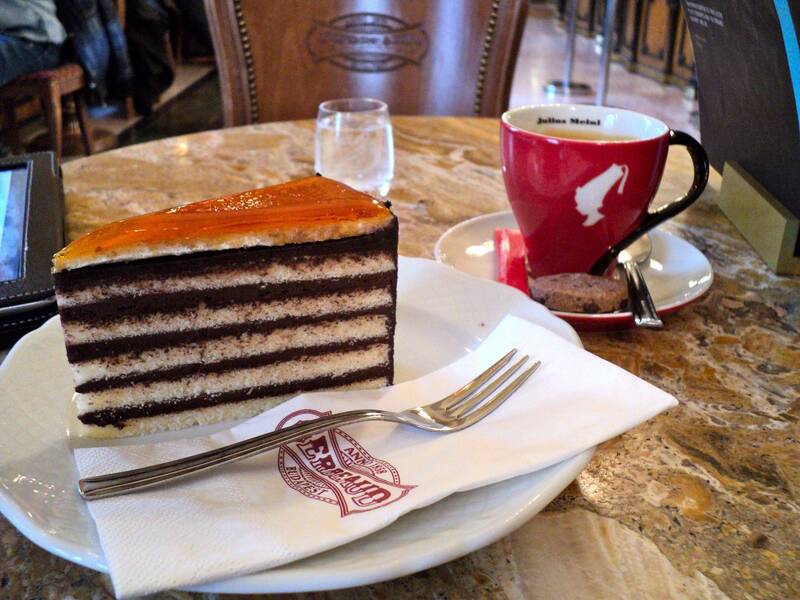 This is Dobos torte at Gerbeaud, five layers tall, vanilla sponge and chocolate buttercream and a caramel lid. In my (unintentional. I think.) quest to visit every famous coffeehouse in this lovely city, I had apparently missed hearing about Gerbeaud, probably because I just don’t spend that much time in Belváros. Hungarians are quiet in public spaces. The subway, the supermarket, restaurants–people keep their voices down. 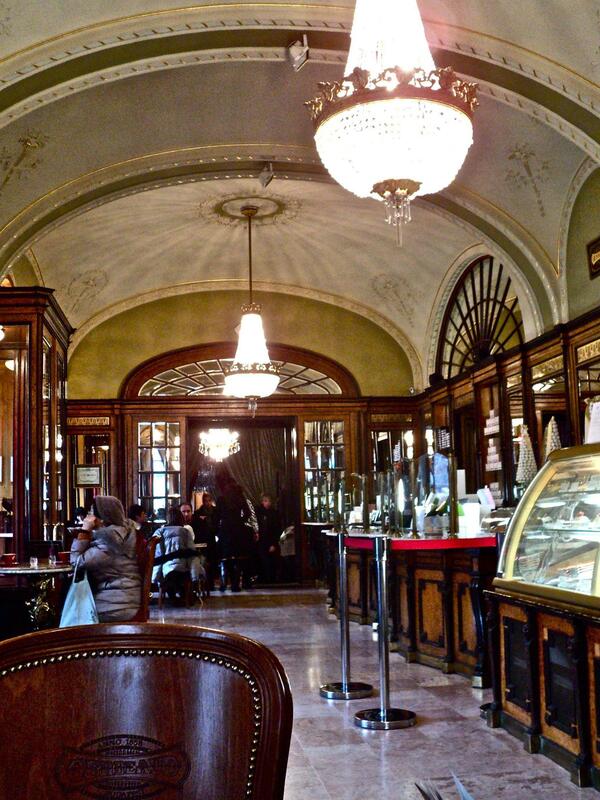 Gerbeaud was full of a quiet hum, Hungarians and tourists alike eating their desserts in peace. So I did my homework and drank my coffee and no one brought me my bill until I asked for it nearly an hour later. The best way to spend a snowy wet Tuesday in Budapest? I think so. Yum! All those cakes sound wonderful; hopefully I get there someday to try them! Every great pastry in Austrohungary? I guess it’s good you live in a 3rd floor walk-up apartment. I look forward to many happy experiments in the Boulder kitchen this summer. I volunteer to clean up. Um, guess whose birthday is in a month-and-a-half? That’s right. Haha yeah, figured that out. I know, get cass to bake it for you. I’m sure she wouldn’t mind. Right?